*yawn* i am slightly foggy from the non-stop weekend. “inception” was a brilliant maze, the indie mart was sunny and charming, my friends were a sight for sore eyes and the dinners and brunches were heaven. still, i am excited for this upcoming week. my inner domestic goddess has been nagging me to attempt a new sweet treat and i have finally found one that sounds out of this world. yep, you heard me. the airy, spongy, sugary cubes we love to toast and float are easy to make in our own kitchens. and, if you pop them into glassine or cellophane bags and seal with a label, they make delightful gifts for your favorite friends and family! for those of you who are not earl grey fans, you can easily replace this flavor (and the bergamot extract} with a favorite one – peppermint, lemon, vanilla – the possibilities are endless. here’s to living a sweeter life. ps – today is the last day to enter our pink blossoms giveaway! 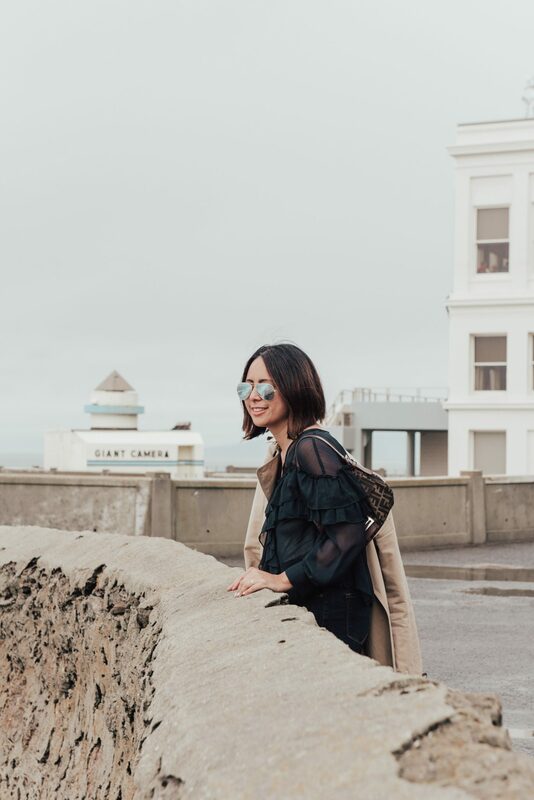 give it a whirl! in bowl of a standing electric mixer or in a large bowl sprinkle gelatin over 1/2 cup cold earl grey tea, and let stand to soften. in a 3-quart heavy saucepan cook granulated sugar, corn syrup, 3/4 cup of cold earl grey tea, and salt over low heat, stirring with a wooden spoon, until sugar is dissolved. increase heat to moderate and boil mixture, without stirring, until a candy or digital thermometer registers 240°F, about 12 minutes. remove pan from heat and pour sugar mixture over gelatin mixture, stirring until gelatin is dissolved. in separate medium bowl with cleaned beaters beat egg whites (or reconstituted powdered whites) until they just hold stiff peaks. Beat whites and bergamot (or your choice of flavoring) into sugar mixture until just combined. pour mixture into baking pan and don’t fret if you don’t get it all out (learning from my mess of a first round). sift 1/4 cup confectioners sugar evenly over top. chill marshmallow, uncovered, until firm, at least three hours, and up to one day. Oh wow! What a nice present! Great idea. I love Smitten Kitchen! 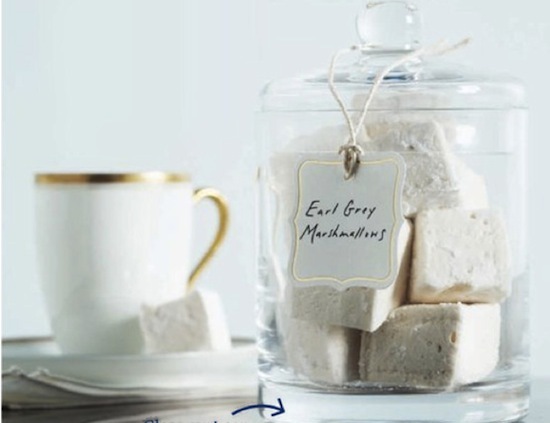 Earl Grey Marshmallows…. wow! I’m dying to try these!! oh yummm!! 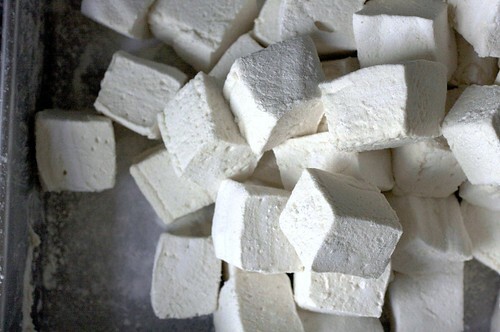 earl grey is my fav tea & i love marshmallows!! this is an amazing combo!! 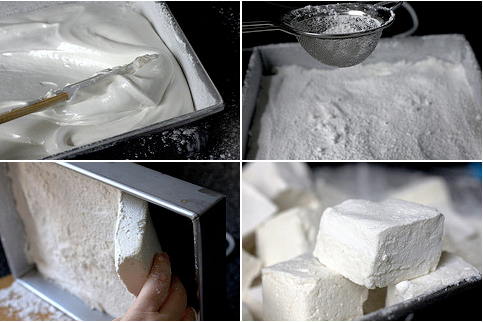 I find it so interesting that you can make marshmallows. who would have thought!